For all courses in medical terminology in any health-related program, including Nursing, Medical Assisting, Medical Coding, Medical Records, Medical Transcription, Respiratory Therapy, Surgical Technician, Radiology, all Allied Health Programs, and even Business Education. Medical Terminology for Health Care Professionals will help students quickly master the modern terminology of healthcare, and learn techniques for decoding any new term throughout their careers. It offers an intuitive system for learning medical vocabulary by building terms from word parts. Every chapter is built around a color-coded word list that shows how word parts are built, pronounced, and defined. Readers are introduced to medical terminology and its essential suffixes and prefixes, and then guided through each key body system. Proven to build both proficiency and confidence in students with a wide range of backgrounds and goals, special topics range from cancer, to mental illness, to lifespan considerations. Innovative pedagogy throughout the book offers plenty of opportunities for students to learn, practice, and connect terminology to real-world clients and clinical settings. The Ninth Edition integrates a new Insights feature that familiarizes readers with some of the latest coding terminology being used in The Complete Official Codebook ICD-10-CM, 2016, better preparing them for working in the field of modern healthcare. 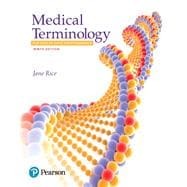 MyLab Medical Terminology is an online homework, tutorial, and assessment program designed to work with this text to engage students and improve results. Within its structured environment, students practice what they learn, test their understanding, and pursue a personalized study plan that helps them better absorb course material and understand difficult concepts. No matter their learning style, students will build a solid foundation of medical language through the interactive games, adaptive Dynamic Study Modules, and narrated lectures in MyLab Medical Terminology.